By Dr. David Walsh, Ph.D. The tenth anniversary edition of this national bestseller goes beyond raging hormones and peer pressure to explain why adolescents act the way they do and what parents and teachers can do about it—and it’s now thoroughly revised and updated to address the issues facing kids today: social media, online bullying, prescription drug abuse, stress, and nutrition. Why Do They Act That Way? was the first book to explain the scientific, brain-based reasons behind teens’ impulsive behavior, lack of focus, self-consciousness, territoriality, fatigue, and their quickness to anger and take risks—to name just a few common teen problems. All these behaviors are linked to physical changes and growth in the adolescent brain. Ten years ago, there was no Facebook, Instagram, or Snapchat. Now every kid has a smartphone and a Twitter account. Award-winning psychologist Dr. David Walsh has now updated his 2004 classic with the most current research into the adolescent brain, and he’s also updated his guidance for parents and teens on navigating the new challenges of the 24/7 online world. With real-life stories and reassuring guidance, Walsh provides realistic solutions for dealing with everyday and major challenges. Sample dialogues help teens and parents talk civilly and constructively with one another; behavioral contracts and Parental Survival Kits provide practical advice for dealing with issues like curfews, disrespectful language and actions, and bullying. As a parent, psychologist, coach, and trusted expert, Dr. Walsh offers the best advice to help adolescents thrive and parents survive. David Walsh, Ph.D., is one of the world’s leading authorities on children, teens, parenting, family life, and the impact of technology on children’s health and development. He founded the internationally renowned National Institute on Media and the Family. He is on the faculty of the University of Minnesota and lives in Minneapolis with his wife, Monica. They have three adult children and five grandchildren. 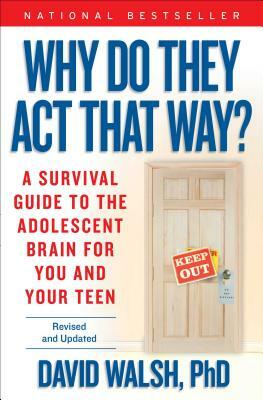 "A powerful, practical book on the teenage brain. Walsh is a storyteller with the gifts of simplicity and clarity. This book is an easy read, but its message is fresh, nuanced, and important. I recommend it to all parents who ask themselves, 'Why do they act this way?'" "You'll finish it feeling as if you've just had coffee with someone who is not only entertaining and enlightening but who knows exactly how it feels to be the mom or dad of a twenty-first-century teen." "Parents will find the book immensely informative,reassuring, and useful. I highly recommend it!"